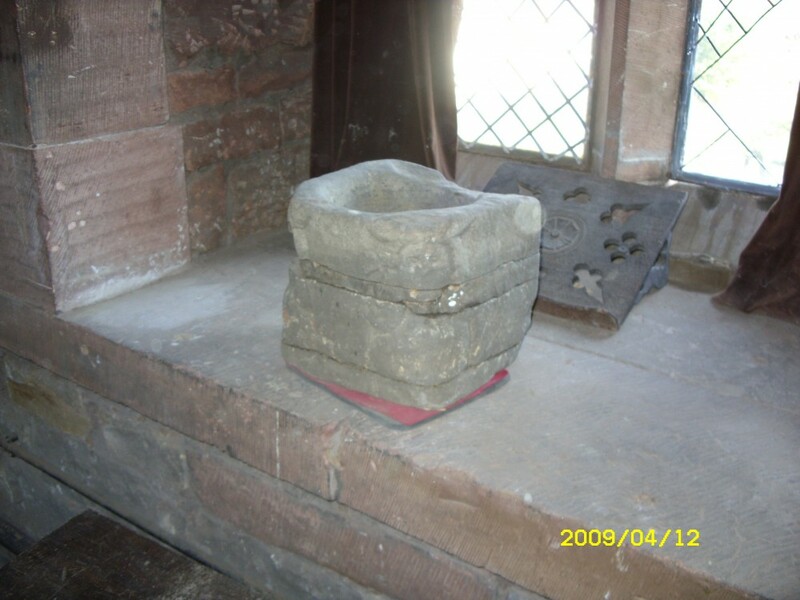 In the bell tower at St. Nicholas' is one of the treasures of the church in Whitehaven. This is by far the oldest church artifact in Whitehaven. It was found in 2003 near the water feature by the front gate of St. Nicholas Gardens. When found it was in 10 pieces and a Conservation Specialist, Clive Bowd, pieced it back together, and provided some conclusions on the item. A piscina is the basin used for washing the Chalice and Paten following the Mass. It would be set into the fenestella (canopied niche) in the south wall of the presbytery. It is dated to late 13th or early 14th century (possibly even late twelfth century), so is clearly not connected with this church, built in 1693. The earliest known church in Whitehaven is the first St. Nicholas Church (outside the Rum Story), in 1642, when there were 9 fishermens houses in the village. However there are Charter Documents from 1359, which mention a chaplain named Richard. While there is no physical or documentary evidence of a chapel at that date, the discovery of this piscina suggests the possibility of a small chapel, which would have been have been under the control of St. Bees. Alternatively it may have been transferred from St. Bees when the second St. Nicholas was built, in 1693, then discarded in the rebuilding of the 1880’s. It is 25cm high x 28 cm wide x 27.5 cm deep, with a concave central basin 20 cm diameter, 13cm deep. The front right hand mouldings are of a female portrait- with clear eyes, face outline and hair, with an indistinct upper torso & arms with clasped hands. The left hand moulding is too damaged to make out its form. The lower central area is a lattice type decoration, with a clear lozenge at the bottom. On the left side is a Gothic style W, from 2 overlapping V’s, with a small cross above. This could be a Masons mark, but as there is feint evidence of a second initial, might be the initials of the benefactor. The cross may be a dedication cross, or a later pilgrims cross, carved in thanks for a safe return home. The various marks recorded on the sides of the piscina can now be ascribed as apotropaics, protective symbols used in warding off evil, malevolent spirits, witches and the like. Three such symbols were recorded a double V overlapped forming a W, now recognised as being a common mark invoking protection by the Virgin of Virgins, Mary the mother of Jesus (Virgo Virginum). The small cross above the last symbol, likewise, may well have a similar origin, warding off demons in much the same way as portrayed in vampire traditions. On the opposite side the lattice etching, or mesh design, is associated with trapping a spirit, effectively netting it. All of the above seem to fit well with the stone under review, possibly more so if it had a secondary use within a blacksmiths forge as postulated in the original report. That said, the former reasoning cannot be ruled out completely, but the weight of evidence based on the latest research, strongly suggests these conclusions. This in no way alters the identification and dating of the stone. What the outcome of the Medieval Graffiti Survey tells me is the vulnerability of people in that period, and the lengths to which they would go in order to try and secure for themselves a trouble free life. Many thanks to Mr Bowd for his analysis on this item. See pages 237-240 of the 2016 CWAAS Transactions for much more information. Please note that, for Health and Safety reasons, the tower exhibition is only normally open when the shop in the porch is open, or by prior request to the Parish Office.Due to the tight, and rare, left handed spiral staircase we request that all visitors wear the provided hard hats.